Urban Archaeology Corps: Teens Dig Into Black History As Urban Archeologists The Urban Archaeology Corps has teens in Virginia getting their hands dirty, in an initiative by the National Park Service to help increase diversity in its staff, visitors and the stories it tells. Kalen Gilliam (left) and Justis Jackson take measurements at the Urban Archaeology Corps excavation site about 10 miles outside Richmond, Va. In a dense, wooded lot, 17-year-old Justis Jackson lies on a mound of dirt. He doesn't seem to mind the sticky heat or buzzing mosquitoes. Jackson's attention is fixed on a buried object at the bottom of a neatly dug hole. "Sounds like metal," he says, knocking. "But what type of metal and how old it is, I don't know. I hope it's old." Jackson is an intern with the Urban Archaeology Corps, a partnership between the National Park Service and the conservation group Groundwork RVA. The program puts teenagers to work on real projects, conducting research, excavating historic sites and cataloging artifacts. 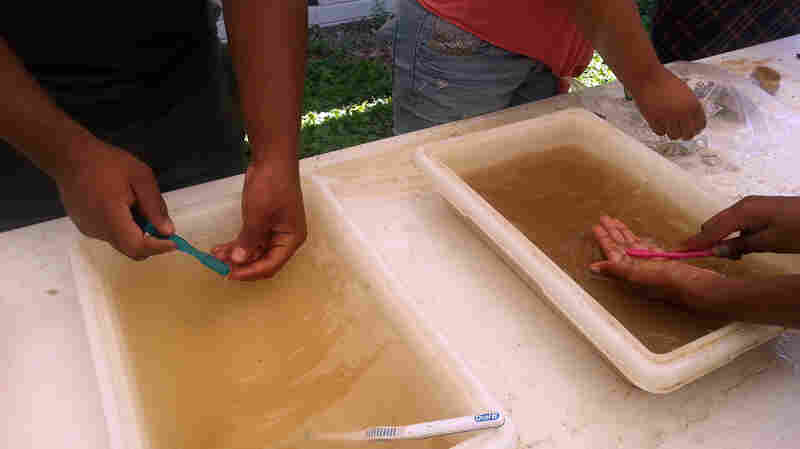 Teens in the Urban Archaeology Corps wash artifacts at Virginia's Fort Harrison. The Corps is part of a park service effort, in advance of turning 100 next year, to increase diversity in staff, visitors and the stories it tells. In Richmond, the teenagers are getting their hands dirty on Gravel Hill, exploring a little-known chapter of African-American history. "The history of it goes back to the late 1700s, with a Quaker slave owner named John Pleasants," says Kalen Gilliam, another teen in the program. "In his will, when he died, he said that any of his slaves age 30 and above, or when they turned 30, they would be granted their freedom and 350 acres of land." This was dozens of years before the Emancipation Proclamation. There were legal challenges to Pleasants' will, but eventually almost 80 people were freed. They built a self-sufficient farming community 10 miles outside Richmond, where descendants still live today. "It's definitely made me see that not everything is as you see it," high school senior Tyasha Casey says. "Everything has a deeper meaning, and it shows how we're not just a minority, we can be something great." Working side by side with park staff, the teens cataloged about 1,500 field specimens: nails, glass, charcoal, even Civil War bullets, possibly from the 1862 Battle of Glendale. The property they excavated belonged to Richard Sykes, the great-great-great-grandfather of retired psychology professor William Anderson. "The history of just regular people is so exciting and so interesting, and it's a time when 'his story' becomes 'my story,' " Anderson says. "And that's when history becomes really exciting, when I see myself in history." Part of the National Park Service's Urban Agenda, the Archaeology Corps seeks to tell the stories of more Americans and increase partnerships with community groups. As the Park Service turns 100 next year, NPS Museum curator Ethan Bullard says the paid internship is a pathway for the next generation of stewards. "This is a textbook example of what the Park Service is succeeding in doing and trying to raise awareness among urban communities, and especially youth communities — to teach them and get them inspired to sort of inspire us back," Bullard says. The Urban Archaeology Corps also had groups in Los Angeles and Washington, D.C. The Park Service is hopeful it will get funding to continue the program next year.